Welcome. 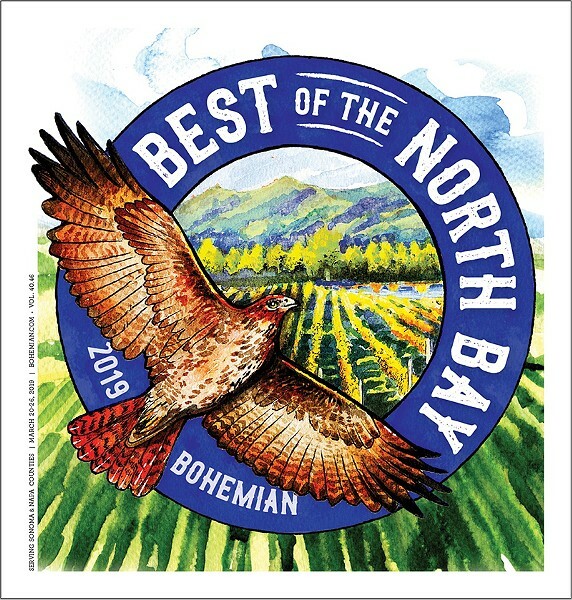 We're once again celebrating the best of the North Bay, with our epic Readers Poll and extensive selection of Writers Picks. It never gets old, putting out these annual issues that celebrate the best of the best of Sonoma and Napa counties. In a world of impermanence, it's good to know that there's always another Best Of issue right around the corner—and that each year, new businesses and people always seem to refresh the proverbial aquifer of greatness. From Best Doctor to Best Winetasting, we've got it covered, and then some, across our various categories. Our winners are a reflection of the community at large that chooses them—and represent the day-to-day goodness that makes living around here a Best Of experience in its own right. This year, Sonoma tattoo artist Shotsie Gorman returns to the Best Of fore to illustrate our cover—may you soar like a hawk through this amazing issue! Rory McNamara was our go-to photographer this year and the Bohemian writers who contributed are Aiyana Moya, Alex T. Randolph, Charlie Swanson, David Templeton, Gary Brandt, James Knight, Jonah Raskin, Stett Holbrook, Thomas Broderick, Tom Gogola and the late Tokey McPuffups. Thanks to all who contributed.